Bay Nordic building on the success of Project Illumination Phase I, Phase II is on target with another new addition to its programming – Biathlon. As part of Bay Nordic’s vision to make N.E.W. a desirable year-round community by promoting an active lifestyle through Nordic skiing for all age groups, the Biathlon fits in perfectly, winter and summer. 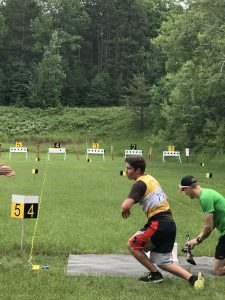 The Bay Nordic Biathlon program is evolving as interest grows. 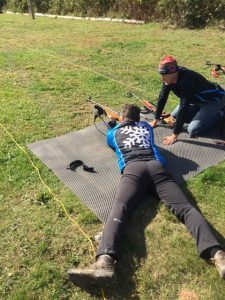 As a ski club we are encouraging adults, and youth ages 12 and above to consider Biathlon as a year-around activity. We are developing activities to include running, mountain biking, skiing, and various combinations. 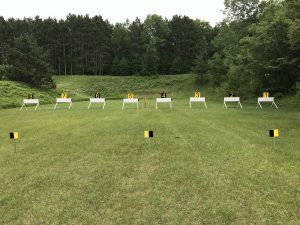 Our Biathlon range is located at the Brown County Rifle Range, which is directly adjacent to the Oaks ski trail at the Reforestation Camp. Access to the range directly is off of the Brown Road exit on I-41. Turn left at the exit and proceed for one mile where the road curves sharply to the right. At this curve make a sharp left and you will see a dirt road and a gate. Proceed through the gate and follow this to the parking area of the rifle range. If you are interested please contact Brian Gustin at blg.gustin@gmail.com. 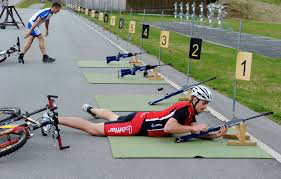 Biathlon is the combination of cross country skiing and target shooting. Pictographs of Scandinavian hunters on skis have been dated back to 2000 BC. 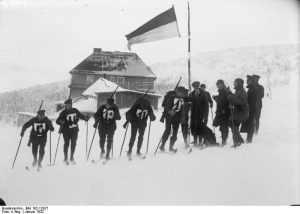 The first biathlon competition was recorded at the Sweden – Norwegian border in 1776. The Biathlon became an Olympic event for the 1924 Olympics in Chamonix, France. 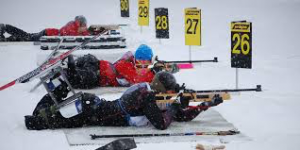 In 1978 the .22 caliber rifle became the official Biathlon rifle and Wisconsin held its first Biathlon event in 2009. Today Biathlon is well organized internationally and nationally. The Bay Nordic Biathlon is a member of the US Biathlon Association and follows its safety and competition rules. Practices are scheduled for Wednesday’s beginning promptly at 5:00 PM and Sunday’s at 1:00 PM. Participants are encouraged to bring poles (skis when there is snow). feel free to contact Brian Gustin at blg.gustin@gmail.com or 920-737- 5462.
will be provided for independent reading. 5KM Novice Event – PP. After Novice race, then a SECOND event for anyone interested (novice and open) is pick your TEAM RELAY at racers choice. Short ski course with lots of shooting bouts. Use 3 spare rounds before having to ski penalty loops. END OF SEASON BBQ, GRILL PROVIDED, YOU BRING YOUR OWN MEAT, ETC. The OPEN races are for USBA “Red Book” safety certified biathletes only. Cash DONATIONS recommend to go directly to DEEDRA IRWIN and her expenses to race with the USBA IBU team. A “Competitor” level annual USBA membership or USBA “member for a day” is required to cover race liability insurance. Bring exact cash or check for payment to event. If you require USBA “Membership For a Day” for this event, please bring the filled out USBA membership form on race day. Copy of USBA form and waiver will be provided in registration confirmation email. Youth Open Race and Novice Race – 11:45 and as soon as the adult race finishes. This event is an Open Interval Start event and a second, Novice Sprint race for Nordic skiers with no previous biathlon experience. Event registration is online and very simple. There is a monetary penalty for same day registration so PLEASE PRE-REGISTER ONLINE at the appropriate link below (Open Race or Novice Race) at least two days prior to the race. No fees are collected during online registration so there is no penalty for registering online and being a no-show. See fee schedule below and online. Note registration will close at Noon on the day prior to the race. 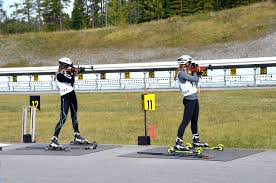 Payment and bib assignment will take place between 9:00 – 9:30 AM at the biathlon range. Please bring adequate warm-up clothes and boots, as heated shelter is limited at the range. There is no running water so bring your own water supply. There is a Port-A-John located in the parking lot however. The Novice race is designed for ages 10 and up providing an authentic biathlon experience. 150-meter penalty loop is included for each missed shot. Volunteer coaches, basic shooting training, rifles, ammunition, timing and scoring will be provided. Our goal is to provide safe and easy access for all participants to have an authentic experience with the Winter Olympic sport of Biathlon. Volunteer help is needed for the event. Please plan on assisting. If you have any questions, please contact: Brian Gustin at blg.gustin@gmail.com. 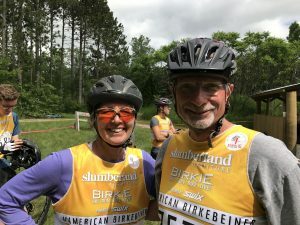 In the event of questionable weather or trail conditions, an email will go out to all registered participants no less than 24-hours before the event. See the registration tab for the last (impromptu) race of the season!